Two runners will run around Bradford in the morning each carrying a red flag. One flag has the words THE REVOLUTION IS HEALING and on the other flag the words THE REVOLUTION IS FEELING. One runner will follow another. Sometimes they will change places thus changing the reading of the message. The runners will also wear the same No 1 running number signifying we are all fundamentally the same. 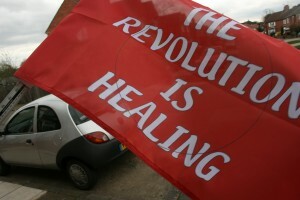 The event has been devised by artist Graham Martin, who was once a Bradford resident, as a precursor to his show ‘The Revolution is Healing’ at Gallery 11 in June 2011. The show and the REVOLUTION RUN are both inspired by the ideas of German artist, Joseph Beuys. The phrases created by Graham Martin relate to notions of common wounds, social sculpture and posit a vision of art and society based on rediscovering and promoting common humanity. The words on the flags point to the fractured relationships of consumer based society. How we are estranged from each other and ourselves by material consumption and virtual pastimes. The Revolution is Healing is a collective way forward through an acknowledgement of our common wounds and the contemporary accumulation of loss. The phrases the runners carry through the streets of Bradford offer a healing vision and a different view of change and development compared with economic ones we are bombarded with. They speak of a collective reunification through healing and feeling of our common bonds and sufferings. They are not consumerist, egoist, or marketing messages, such as we are surrounded with so often in contemporary society. They are a message of healing for Bradford and for the world. Bradford has over many years suffered from problems and so often economic investment and re-branding is seen as the way forward but just for this morning through the actions of the two runners and the message they carry, we want to promote a deeper thought and solution. If you see runners Emma and Flossie please cheer and clap them, they carry all our hopes and wishes.